Cranberries are susceptible to pests and weeds, which makes organic growing particularly arduous. That hasn’t stopped these farmers from trying. You could lose hours of your life trying to find fresh organic cranberries for your Thanksgiving relish. Organic growers produced about 2.8 million pounds of the tart berries in 2016, a mere 0.3 percent of the overall market, according to a report by IndexBox, a market research publisher. Because they are grown on vines in wetlands or bogs, cranberries are susceptible to an impressive suite of pests, fungal pathogens and weeds that are difficult to control, which makes organic growing particularly arduous. That hasn’t stopped a small but determined band of farmers in Oregon and Washington from trying. There are now 11 cranberry farms in the two states that are certified organic, up from four in 2002, according to data from the USDA National Organic Program’s Integrity Database, and there are 48 such farms nationwide. Richard Schmidt, a relative newcomer to the organic cranberry business, finds weeds particularly vexing. “We need a silver bullet that can control the weeds and leave the cranberries alone,” he said. Nearly three years ago, Schmidt bought his 64-acre farm in Bandon, along the Oregon coast, after retiring from the tire business. The previous owners had already begun transitioning some of the cranberry bogs to organic, a three-year process that involves using no pest, fungal or weed controls that are prohibited by USDA organic standards. Schmidt decided to continue the move toward organic. Since he’s farming largely as a hobby and has money to invest in the business, he was able to give his cranberries what he called the “Cadillac experience,” deploying double or triple the recommended amount of approved fertilizers and pest controls like Peruvian bird guano and organic-compliant insecticide. His method appears to be working: In 2016, the farm’s last year of transitioning to organic, he harvested 126,000 pounds of cranberries from 16 acres. This year, those same bogs produced 226,000 pounds of berries. Across the U.S., the cranberry market is dominated by Ocean Spray, a cooperative owned by 700 growers. Aside from a few organic growers in Canada, Ocean Spray mostly sells conventional cranberries, with less stringent standards for fungal, pest and weed controls. Ocean Spray spokesperson Kellyanne Dignan said the cooperative’s growers are “excellent stewards of the land” driven by what consumers want. Chemicals commonly used on cranberries include diazinon, a pesticide that controls insects on a range of fruit, vegetable, nut and field crops. The USDA Pesticide Data Program found that 5 percent of conventional cranberries sampled in 2016 had traces of diazinon. The pesticide was banned for residential use in 2005 based on the risk it posed to human health, though it is still allowed in agriculture. The chemical is also harmful to wildlife, according to a January 2017 Environmental Protection Agency report, which found that 78 percent of more than 1,800 animals and plants protected under the Endangered Species Act are likely to be hurt by diazinon. Dignan said Ocean Spray’s cranberry growers take the use of crop protection products seriously. Although the additional labor associated with growing organic cranberries drives up the expense, there is money to be made. 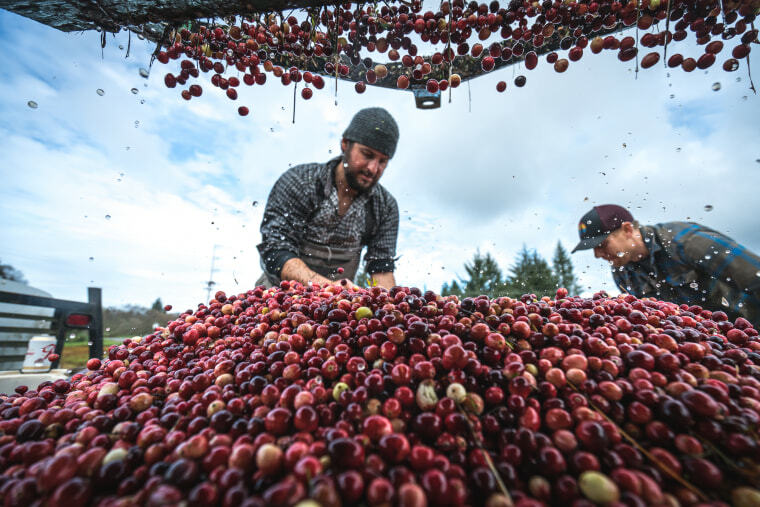 The conventional cranberry growers who dominate the market have seen prices for their cranberries plummet amid recent market shifts — including the rise of Quebecois growers, said horticulturalist Kim Patten, county director of the Pacific County Extension Office of Washington State University. Capitalizing on cooler climatic conditions that attract fewer pests and weeds, the Canadian growers have contributed to an oversupply that led the USDA to establish volume controls for U.S. cranberry farmers for the past two years, forcing them to hold back a quarter of this year’s crop. Organics are exempt from this restriction, so those farmers are allowed to sell their full crop. Organic farmers can also charge more. Schmidt said many conventional farmers are earning “rock bottom juice prices” of about 20 cents a pound, a figure confirmed by Patten. In contrast, Schmidt’s broker, Wisconsin-based Cranberry Partners, paid him up to $1.25 per pound for this year’s organic harvest. “It certainly helps the retirement fund,” Schmidt said. But organic isn’t a sure bet when it comes to cranberries. Growers need support from scientists and other industry stakeholders, said Jared Oakes, who took over the Starvation Alley farm in the peatlands of Long Beach, Washington, eight years ago with his partner, Jessika Tantisook. The biggest need is a safe product for controlling noxious weeds, Oakes said. Weeds can reduce cranberry crop yields by up to 15 percent, Oregon State University reported in a pest management plan, and organic farmers say current strategies for fighting back are mostly useless. Organic growers are permitted to control weeds with vinegar and a product called Suppress, an herbicide composed of caprylic and capric acids. Both products have to be wiped on to prevent harm to vines, so Oakes and others end up plucking acres of their own weeds by hand — a strategy that they say is time-consuming and not sustainable. Starvation Alley has found a helpful ally in Oregon State University and Oregon Tilth, a nonprofit organization that certifies organic farms. Together they established an annual gathering of cranberry growers to share best practices. Oakes and Tantisook hosted the first meeting, in 2017, the Schmidts managed the second, and talks are currently underway to get cranberry growers together again — organic or otherwise. Schmidt said he tries to get his peers to make the switch to organic but they can’t seem to “leave their comfort zone.” He, on the other hand, loves the “warm and fuzzy feeling” of being able to put a handful of cranberries in his mouth without worrying. But at the end of the day? “It’s about the money,” he said.